Call me nuts for taking a punishing trip traveling all day and night - from coastal El Nido to mountainous Kabayan in Benguet. It started on a Friday early morning and didn't stop till mid-morning the next day. This involved taking the RORO bus from El Nido to Puerto Princesa (6 hours) where I waited (6 hours) for a Philippine Airlines flight to Manila (1 hour) to catch an overnight Victory Liner bus bound for Baguio (6 hours) before eventually riding a chartered jeepney the next day to a Ranger Station in Kabayan, Benguet (3+ hours). Whew! Most people who heard of my itinerary balked at such a schedule. In terms of time management, it suited me just fine since I didn't have an endless supply of vacation days. My only worry that time was if one of the transport mode broke down or got delayed, then everything else got screwed. I tried dispelling any thoughts of a major delay - which is what's common - with Philippine Airlines. This being summer, I didn't even want to worry about inclement weather. All I really wanted after being on sea level was to snag a summit. Trekking after all has always been something I enjoy doing especially where this involves hills and mountains. In fact, I consider myself more of a mountain guy than a beach person. Nothing can get as closer to nature for me than actually walking on a trail - never mind the mud, bugs, heat, cold and body odor. More than the views, there's this certain level of calm that I achieve whenever I begin seeing clouds at eye level. For a long time, I've been wanting to go up Mt. Pulag - the third highest peak in the Philippines. I've climbed the highest (Mt. Apo) thrice but somehow never made it to this mountain in northern Luzon island. Given that planning and logistics were not possible for me, I went searching around for outfitters until I found Yabag, a sensible choice since it's a mountaineering organization. For 3500 PHP, the package included round trip bus and jeepney transfers, 3 meals, guides, camping fees and a souvenir T-shirt. My contact person with Yabag was Miguel. The plan was to meet him and the rest of the group at the Victory Liner Bus Terminal in Pasay at 9:30 PM. When he texted me that Friday morning, I was still on the RORO Bus on its way to Puerto Princesa. I arrived in the city at 12 noon, exactly 6 hours since leaving El Nido. My flight for Manila wasn't leaving till 6 PM so I had plenty of time for lunch and Internet (it was such a hot afternoon that killing time in an Internet cafe was a life saver). I took a tricycle to the Puerto Princesa airport terminal only to find that it does not open until 3 PM. All flights have been clustered in groups of mid-morning and early evening arrivals/departures which meant that the terminal is effectively closed between those times. Despite the stifling heat, plenty of sweaty passengers were making a bee-line outside. Adjacent to the terminal parking lot was this airconditioned coffee house where I took refuge (and took advantage of free WiFi). Right after checking in, I found out that that my Philippine Airlines flight will - of course - be delayed by an hour. This meant arriving in Manila at 8 PM. Knowing I still have to exchange my bags at the luggage storage in NAIA 2 (grab my big backpack and stow the other bag with soiled beach clothes) before hailing a taxi to the bus terminal in Pasay, my only hope was no evening traffic jam in Manila (yeah right!). What's worse than the delay itself was the airport terminal's congestion within the departure area. Four flights (Philippines Airlines, Cebu Pacific, Air Philippines and Zest Air) were leaving within minutes of each other that evening so just imagine the number of passengers squeezed in the humid confines of the building. Even the Monobloc chairs that were added to allow more passengers to seat were not enough. 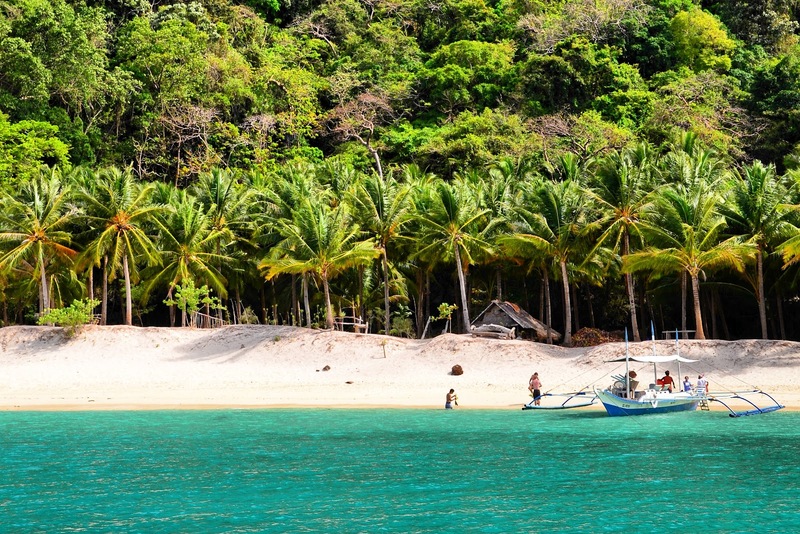 If this is what departing Palawan visitors has to endure, I wonder if their fond memories of the islands and beaches will not fade away? After deplaning at the NAIA 2, I immediately went to luggage storage in the Mezzanine Level (or right before reaching the luggage carousels). Bags can be stored here for 150 PHP per day. I've already prepared my trekking backpack so I was all set to go. Hailing a taxi has always been best done just outside the Departures area but since this was past 8 PM when there was no more departing flight, it felt like a rainy day when everyone is fighting for a rare taxi. Luckily, I heard a man close by shouting "Victory Liner Pasay!" to a taxi driver. Drivers of course are too eager to pool passengers. We both got in plus another lady (whose destination is on our way), paying 150 PHP each. Manila's traffic that Friday evening turned out to be . . . not bad. While it wasn't a stressful taxi ride, I find it odd that Manila still has no central bus terminal. Each bus company has its own little grimy nook along the length of EDSA, making it quite a frustrating trip for first time visitors planning a provincial foray. As soon as I made it to Victory Liner bus terminal in Pasay, I sought for my group which was not difficult to do - all I had to look for were tell-tale signs of backpacks and trekking shoes. I even correctly identified Miguel! After quick introductions with everyone (there were 12 of us including Miguel and his 2 sidekicks), we boarded our Baguio bus for a prompt 10 PM departure. Tired as I was, I still took Melatonin pill to help me sleep. A compressible camp pillow for my back and a fleece jacket for the Arctic bus airconditioning made the overnight journey more bearable. With no major traffic to contend with, our bus made it to Baguio at 4 AM where it was still dark and cold. From the bus terminal, we walked with our bags to a parking lot where our chartered jeepney was waiting. Travel time to Mt. Pulag National Park Ranger Station in Kabayan, Benguet is about 3 hours. Seating inside the jeep while it was negotiating hairpin curves proved a bit nauseating for me that after our scheduled breakfast stop (where we also bought packed lunches), some of us went up the roof for the so-called top load ride. 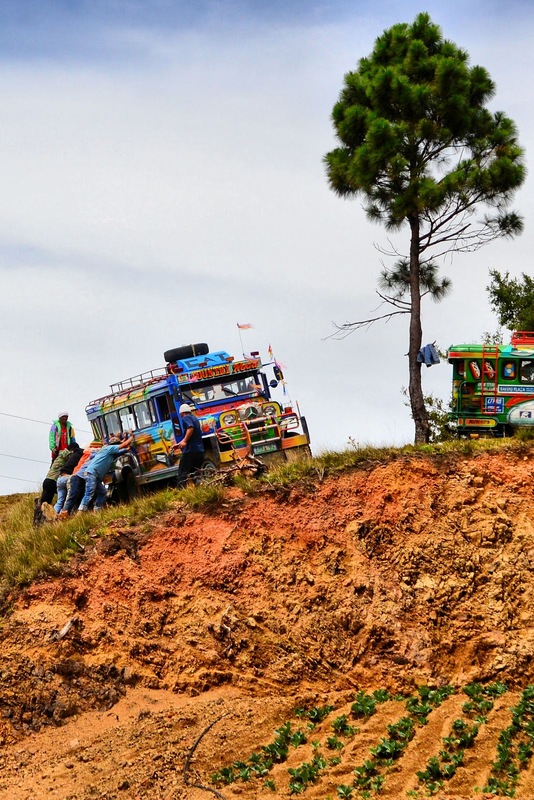 If there's any good place worth doing this, riding atop a jeepney anywhere in the Cordillera region of Luzon is unbeatable. Before we could proceed to the Ranger Station, we had to pass by the DENR (Department of Energy & Natural Resources) office for registration and briefing. But what a crowd of trekkers! There were already other groups ahead of us so we waited for our turn while more groups kept coming in. The briefing with video presentation turned out to be almost like an hour-long lecture given by this very stern woman who looked like a spinster teacher. As soon as the briefing was done, we rode back on the jeepney taking the rotten road to the Ranger Station but stopped midway due to road repairs going on. We walked with our backpacks to this tiny village called Babadak where the Ranger Station is. The trek officially starts here. Since it was almost lunch time, we ate our lunch bought earlier - a simple fare of fried chicken and steamed rice that we devoured with our bare hands from a plastic bag. Those plastic bags of course were not thrown just anywhere. "Leave nothing but footprints", as we always remind ourselves. Now fueled with enough carbs and protein, we were all ready to go. The long journey I took just to be here is just about to begin. now doing that on straight hours and meeting us after for a dinner was just impressive. but the reward was that youve seen the best of both the mountain and the sea. Wow, this was crazy. I don't think I can come up with this itinerary, given my personality, I probably would have suffered too much with worrying, that in order not to, I probably would have arranged to stay one night in Manila. Anyway, I'm glad it all panned out well! I had to maximize my time Jeruen. Lucky me that everything just turned out fine after all. Grabe ang sched mo kuya. Ikaw na! Haha. Lagpas 24 hours yung travelling time mo pa lang. I`m looking forward to read the rest of the posts. Ang ganda ng photos, as usual. Salamat Hoobert, while it was a frenetic schedule, mabuti na lang at nagawa ko lahat na walang aberya. omg, you really squeezed in a lot with this vacation. I had to do this trek Maria. Besides Mt. Pulag having been on my wish list, I needed some serious work out after eating so much calorific food in the Philippines! What's your vitamin? Wow! I salute your energy. Love the photos. Ingat lagi. Haha! I wish I had limitless energy - napapagod din ako. Thanks for appreciating the photos! dennis, i highly recommend you to be the best endorser for the battery called energizer! kakaiba ang zest, passion, whatever you call it, sa traveling. ang husay! i'm sure fatigue or even pagod don't exist in your vocabulary. oh they do! i remember you know how to indulge in massage and self-pampering department. bottomline is, you know how to maximize time, effort, well-earned money (imagine, may T-shirt pang libre sa P3,500 na tour package), vacation and living-life-to-the-fullest in the truest sense of the word. It will take the fun out of travel for me with that kind of a schedule. Nag topload ka pa for an added thrill! Is riding topload legally allowed in some areas in Pinas? An unexpected bump in the road, a sudden tight turn or an emergency stop will send a toploader flying in the air with dire consequences. Top loading (on jeepneys & buses) is something common in the provinces where transport services is oftentimes few and far between. 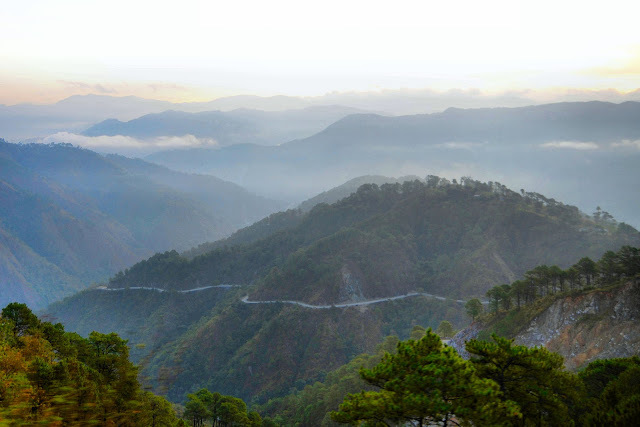 In the case of our trip from Baguio to Kabayan, it wasn't so hard at least for us who were up there since the rough terrain itself didn't allow the jeep to go so fast. Of course, we had to hold on to the roof racks firmly - while enjoying unimpeded views of the mountains! Medyo nastress ako sa byahe, kahit binabasa ko lang. Hahaha! And yeah, sana nga meron nang central bus station. At least one for northbound buses and another for southbound. Another epic trip, Dennis! Thanks Gay, I do hope MMDA or the local government in Manila would undertake a project for a centralized bus station - we'd all be happy kahit nga one for northbound and one for southbound buses! Aws, talaga. Many of us indulge in similar activities anyway. Never heard of that mountain you've hiked into. Nice name for a mountain! I'm getting good at managing stress now - living in a big city is stressful as it is. Para nga raw Energizer battery sabi nila, hehehe! napapagod din ako. Thanks for liking the photos! Whew! Buti nalang hindi sobrang delayed yung flight mo. Both destinations are favorites actually pero hindi ko tinuhog. :) Wonderful experience. I did that once before but mine was Bali to Sagada. I just went home to pick up my backpack and rode the bus to Baguio.